When you’re a child and you fall down, it’s usually not a big deal. You scrape your knee, have Mom apply a bandage, and continue playing. When you’re an adult and fall down, it’s also usually not a problem – unless it’s outside, or on snow and ice, or down some stairs. 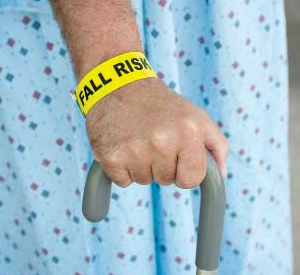 Almost 1,800 people living in nursing homes die each year as the result of falls. Every year, an average nursing home with 100 beds reports 100 to 200 falls. Many more falls go unreported. Almost 20% of nursing home falls cause “serious” to “very serious” injuries. About 35% of fall injuries occur among residents who cannot walk. Falls result in pain & suffering, disability, and rapid functional decline. The fear of falling again can cause accelerated loss of function, feelings of helplessness, depression and social isolation. For the elderly, it’s a whole different story. When an older person falls down, their very fragile bones can result in serious injuries and complications, including even death, which can prompt a Massachusetts wrongful death lawsuit. Nursing home fall injury claims are almost as common as Massachusetts nursing home medication error claims. If you have a loved one who has suffered a serious fall in a Massachusetts nursing home, you would be well advised to speak to an experienced Boston, Massachusetts nursing home fall injury lawyer, because doing so can maximize the chances that your loved one will receive substantial compensation for his or her injuries, as well as decrease the likelihood that such an accident will happen again. These cases can be complex. If the law firm representing you or your loved one is not very experienced in litigating Massachusetts nursing home injury cases, serious legal mistakes are almost certainly going to be made. Winning Massachusetts nursing home fall injury cases requires lawyers who thoroughly understand a simultaneous mix of legal concepts involving Massachusetts premises liability, Massachusetts product liability, Massachusetts nursing home liability, as well as Massachusetts medical negligence. In Massachusetts nursing home liability cases, all these distinct areas of law (and more) are interrelated. It takes a very skilled and experienced Massachusetts nursing home injury law firm to handle these types of cases. The Law Offices of William D. Kickham and Associates has demonstrated years of proven success with Massachusetts nursing home fall injury lawsuits. We know how to investigate these incidents, determine who the responsible parties are, and pursue legal and financial accountability for Massachusetts nursing home neglect and abuse. You can read about our legal case successes by clicking here . At the Law Offices of William D. Kickham and Associates, we are not only experienced legal technicians in this area of law. We understand that nursing home residents deserve compassionate and aggressive advocacy when injuries or neglect occur with their care. Dealing with a situation like this without an experienced Boston, Massachusetts nursing home fall injury attorney, is not a good idea. Nursing homes are represented by experienced defense attorneys and liability insurance companies. They know how to defeat injury and neglect claims brought by family members who are not represented by experienced legal counsel. So, don’t try to make a claim by yourself. Many people don’t know how to proceed following a nursing home injury accident, or many other kinds of accidents that are caused by someone else’s negligence. To learn more about what to do and not to do following an accident or injury caused by someone else’s negligence, click here to receive our FREE article, “The Top 10 Things To Do After Suffering An Accident Or Injury In Massachusetts.” This document offers important information about how to protect the rights of an injured person, following an accident or injury caused by another person’s negligence – and this includes nursing home injury and neglect victims. The fact that you are reading this page, now, is an action step in the right direction. Our attorneys have worked with many nursing home injury victims, and are skilled in the legal and investigative strategies needed to successfully recover financial damages following such an injury. These actions are important to not only assure that the victim receives compensation, but to require the nursing home to correct the errors moving forward. Muscle weakness and walking problems, which account for almost 25% of falls in nursing homes. Medications, which can increase the risk of falls and fall-related injuries. Drugs that affect the central nervous system, such as sedatives and anti-anxiety medications, are especially dangerous. Most people would be stunned to learn how patients are allowed to walk after receiving sedating medications. Environmental hazards such as wet floors, poor lighting, incorrect bed height, and improperly fitted or maintained wheelchairs. Inadequate staffing to monitor patient activity. Failure to use proper procedures, such as using a support belt with patients during therapeutic exercises, or failure to provide adequate assistance in going to the restroom, getting out of bed, or maneuvering a wheelchair. A lack of handrails, grab bars, and bed rails in nursing home resident rooms and restrooms. Other causes of falls include inadequate foot care, improperly fitting shoes, and incorrect use of walking aids. Massachusetts Nursing Home Falls -- Who is Liable? Nursing homes and long-term care facilities face a heightened requirement to adhere to safety codes, ADA regulations, building codes and other legal requirements. Under Massachusetts law, failure to adhere to these regulations may be evidence of negligence, for which the owner of the nursing home can be held liable. Further, nursing homes sometimes contract patient care out to third parties. Careful investigation is needed to identify potential additional defendants in such a case, for financial recovery sources. You should also know that if you sue a nursing home, any verdict or settlement that is paid does not come from the nursing home, but its liability insurer. We work not only with medical experts, but with building engineers and safety specialists, to determine if any safety code violations or defects were present, or if the actions of the nursing home staff or related personnel caused or contributed to the fall. If you suspect that your loved one's fall in a nursing home is the result of an error by the nursing home, contact The Law Offices of William D. Kickham & Associates at Ph. : (781) 320-0062 or Ph. : (617) 285-3600 or click here to send us a confidential email. We have offices conveniently located off Route 128 in Westwood, Massachusetts and in downtown Boston, Massachusetts. However, we regularly travel to nursing homes to visit injured residents, or to the homes of family members, in order to assist with your complaint. Because cases that we accept are taken under the contingent fee system, you will pay absolutely NO FEES unless we win your nursing home negligence case on behalf of your family member. Contact us at (781) 320-0062 or (617) 285-3600 or click here to send us a confidential email. We offer all of our legal clients a FREE INITIAL CONSULTATION of up to 30 minutes and will respond promptly to your call or email about your injury. Obviously, you know there is more than one law firm in the greater Boston area advertising a specialty in nursing home falls. The problem is, not all these firms are, really, “specialists.” As a Boston, Massachusetts nursing home abuse and neglect law firm, we have years of experience in handling these specific types of cases. Our case successes demonstrate this. You can also click on the link later in this sentence to check out Attorney William D. Kickham’s professional biography. We deliver compassion-driven and aggressive legal advocacy for victims of Massachusetts nursing home neglect. We don’t rest until your loved one has been made safe again, and has been compensated for whatever injuries they have suffered. Period. If you even suspect that there is a problem with the care your loved one is receiving in a Massachusetts nursing home, call us at Ph. : (781) 320-0062 or Ph. : (617) 285-3600 or email us confidentially, now. Making your loved one safer for the future means taking action now. Call or contact us to discuss your questions.